MAKING SENSE THE HORSE LOCOMOTION ANALYSIS BY COMPUTER - . : Toledo Horse :. MAKING SENSE THE HORSE LOCOMOTION ANALYSIS. Comments by: Dr. A.P.Toledo – Engineer, vet assistant, horseshoeing instructor & horse locomotion researcher in Brazil. You could gather a mountain of measurements and calculate and chart different variables on your computer to your heart's content, but the trick is to sift out the information that is relevant to your application. What can motion analysis tell you? In humans, biomechanics has found successful application in several areas. In orthopedic medicine and rehabilitation, the injury's mending progress can be monitored; in manufacturing or business settings, methods to enhance efficiency of certain job tasks can be found; and in sports medicine, motion analysis has been used to improve athletic performance in a variety of sports, including golf, track and field, baseball and tennis. Motion analysis has even aided in the development of a space suit for NASA. Studies of gait analysis in horses with high-speed cameras figures were first published by researchers in the 1970's. Building on this foundation, other researchers have described the gaits of Standard bred trotters and pacers, galloping Quarter Horses and Thoroughbreds, dressage horses, jumpers and cutting horses. Once normal equine gaits were described, exceptions on both sides of the spectrum, could be distinguished. At one end are horses whose gaits deviate from the norm because they are lame. In these cases, gait analysis plays a diagnostic role. To check for soundness or hoof balance, horses are usually filmed at the trot since this gait is inherently symmetrical and any signs of lameness (i.e., any disruption of symmetry) are exaggerated at this pace compared to the walk. For example, suppose you taped a sound horse moving at a leisurely trot, then viewed the tape in slow motion. You may be surprised to see that the diagonal limb pairs do not strike the ground simultaneously, as it is commonly thought they do. Instead, the hind limb often precedes the fore both at hoof impact and lift-off. (Wrong). In general, during the classical trot, most of the gait analysis showed that the fore hoof hits the ground before than the diagonal hind hoof. This is called: a positive dissociation. The hooves, quite often, doesn’t strike the ground simultaneously. Then, it is not an exclusive fact of the lame horse. My experience with gaited horses are convincing too. But in a horse which is lame, the sequence and timing of limb placements and lift-offs may differ at the right and left sides. This fact is dependent of the stance/phase time relation. Horses undergoing rehabilitation may also benefit from gait analysis. Fig. 1 - GAIT SPECTRUM, for example, of a Luzitano Horse: stride length (m), body velocity(k/h), hooves stance/phase ratio during a complete stride(called diapason), stance and phase time of each hoof, diagonal dissociation at both diagonal stances, asymmetry of the gait, lateral stance time, lateral/diagonal relation, called Lateral Coefficient (CL) of the gait, mono, double fore, double hind, quadruple stance time, complete suspension, etc. The black lines are hoof stance time and the sliced line are the hoof flight time. M1 and M2 (fore hooves) and P1 AND P2 (posterior hooves). All the sound horses – shod or unshod – are also benefited from gait analysis. The shoeing process is a necessary evil. It can improve or impair the horse’s performance and, of course, the gait. Also, the hoof trimming and hoof angle are quite important in modifying the hoof phase during the stride and gait. 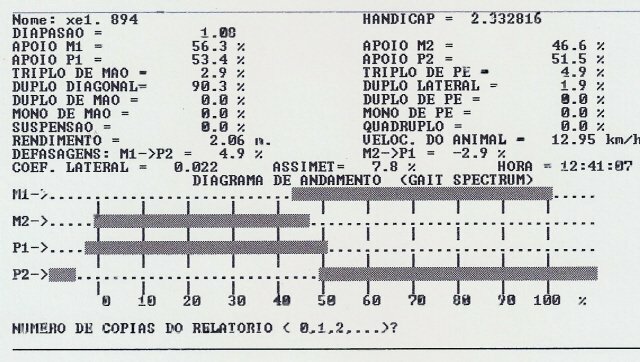 Just as physical therapists could use biomechanical analysis to evaluate a patient's progress, a clinician could compare a horse's movement before and after the hoof trimming and/or the treatment to help evaluate its effectiveness. At the other end of the gait spectrum are talented horses which perform in a superior manner. Their ability to move more economically or efficiently than their less gifted peers contributes to their success in competition. When a superstar comes along only too rarely, the contrast can be spectacular, as in the classic Secretariat. Clayton and Deuel each have focused researches in this area, and because the skills to excel at one equestrian sport may differ significantly from another, they've found plenty of work to do. The ANALOC-E is the most modern non invasive system and real-time horse gait analyzer which produce a GAIT SPECTRUM with 23 gait parameters, from which many studies can be conducted. See the Fig. 2, for example: stride length (m), body velocity (k/h), hooves stance/phase ratio during a complete stride(called diapason), stance and phase time of each hoof, diagonal dissociation at both diagonal stances, asymmetry of the gait, lateral stance time, lateral/diagonal relation, called Lateral Coefficient (CL) of the gait, mono, double fore, double hind, quadruple stance time, complete suspension, etc.